Thank you so much to my fellow Blogger Cathe at Atypical60 for having the insight to know just how much I would love the opportunity to banish a few people from all of our lives! She has nominated me for the Room 101 Bloggers award and given me the responsibility to pick five more bloggers who are also gonna love it! Here are my five banishees . . . The first person I would banish is that idiot who hangs around at the side of the pedestrian crossing, fiddling with his mobile phone and daring you to guess whether he is going to step out and cross the road, until you stop, of course, when he saunters off down the sidewalk. Call me sexist but this is usually a male. Then there’s that person overtaking you and you just know (is it instinct or the sound of their engine?) that they’re going to cut in, in front of you, without indicating, causing you to brake suddenly. Predictably they wander across into the fast lane. Hang back to avoid the prang they are bound to cause and watch them go! Banished! And I’m still on the road. How about that person who just stops? No indicator, no evidence that they are waiting for a parking space, no particular reason until, oh yes, the friend inside is collecting their bags together before being dropped off. Well, don’t mind me and the rest of the road users who actually would like to proceed, without you impeding them. Banished! The plastic bottle is another thing I would banish. The plastic bottle is polluting the oceans and yes I know they are recyclable so why the hell doesn’t anybody recycle them? How do they get in the river? I could understand the need for bottled water in places where the water supply is not good. Heaven knows there are plenty of locations on this planet that have no clean water. But these bottles are taking up whole aisles in our city supermarkets, where nobody is deprived of clean water. Banished! Government websites. OK I love the idea of one secure password for everything, it’s brilliant! Tax, pensions, medical info . . . . So I expect to be able to sign in there ONCE and access my linked accounts. But “Oh No, whatever made you think that one password meant one password? When we say there will be one password, you still need a password for your linked accounts.” Excuse me, that’s two passwords and possibly even several passwords, not just one, so stop telling me it’s just one flipping password! The person who does this stuff is incognito and probably being paid a fortune to sit in some obscure basement and dream up ways of frustrating the general public. Banished! – If we can find him that is . . . I love my Room 101 badge and will wear it with pride! 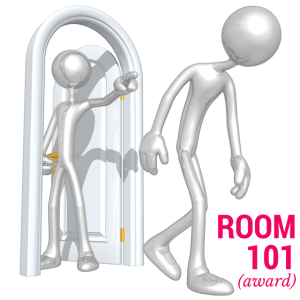 Award 5 bloggers who fascinate, intrigue or tickle your curiosity with the Room 101 (award) badge logo on their About pages and linking to them in your post. Tell us the 5 things you would banish to Room 101! Attach these rules to your post. Grab your badge above and enjoy adding it to your trophy case, but please be respectful of the creator of the award by never altering the logo and never changing the rules. Maddy at Home Retirement Blogger, futurist, thrift shopper and maker of wonderful waffles. My Seniors' 60+ website is at www.maddyathome.com. Please check it out and send a link to your Mum or your Grandad! "Sshh Maddy is writing" is for my other Writing efforts . . . LOL!! Love this one and gladly accept this….it gives me a chance to gripe!!!! Yippie! At first I thought we had to write on our we had to do our banishes on “things that make me mad while driving” LOL until I read your last two! I crack my self up! I will work on this and post it soon! I am honored and thanks! Now this is fun 😄😄 Chuck them out asap. ha.. great things you are trying to banish especially on the traffic side.. It can be anything Nettie, things, places, people, limited only by your bravery! That’s great, it’s interesting to find out what ticks different people off! Well done! You might need to tell your nominees, probably in their comments – or you can go to one of their posts or about me page and copy the link from there. When you publish it like that, it automatically notifies them in their comments. Something to remember if you get lots of awards lol! OK thanks…I already left word to each one with link on post…. This is cute! Well done..hugs! Hello Dawn, it was a good idea for an award wasn’t it? I love this and will gladly accept the nomination. Thanks for the nomination Maddy. I have made the blog an award free blog so I would pass on it. You should try driving in North Cyprus, Maddy – the rule is that there are no rules. People will cut you up, park on the pavement with the rear of the car sticking into the traffic, park across parking spots, park on roundabouts facing the wrong way, treat the highway from Kyrenia to Nicosia as the F1 training track and wonder why there are spectacular crashes, high accident rates, people yakking on mobile phones, hardly anyone signals, hardly anyone wears crash helmets BUT there is no road rage. Incredible. Everyone knows the other driver will do mad stuff because THEY do, so they are amazingly tolerant of the insanity. You need nerves of steel to drive in this country! Yes we are lucky to have road rules, I guess it’s because of the rules that I get so annoyed that people break them! I really enjoyed this and I’m in total agreement! Hi Mary, always happy to whinge on your behalf! In Australia we English are known as “whinging poms!”. Thanks for visiting!